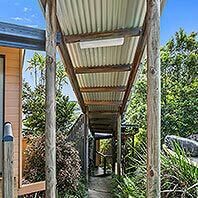 Situated on Hovard Road, Maleny, we have six luxuriously appointed private and separate cabins all at reasonable rates and all joined to the main building by a covered walkway. Spoil yourself – Everything you need to relax completely is at your fingertips – our cabins feature private decks, open spa bathrooms all overlooking scenic valley views. Wake up each morning to this special view & enjoy a hot breakfast served free out on the deck of our Function Center, again overlooking the valley. Our luxury accommodation is the perfect for a romantic getaway or an ideal location for couple’s accommodation on the Sunshine Coast. The Sunshine Coast is the wedding capital of Queensland and Maleny & Montville have several beautiful wedding locations in close proximity to our luxury accommodation, so if you need accommodation for an upcoming wedding, Top of the Hill could be just the place you are looking for. Couples retreat where you can really escape. 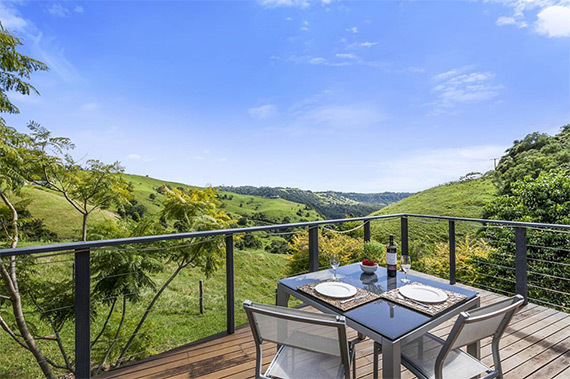 Top of the Hill is the ideal couple retreat, nestled in the tranquil rolling hills of Maleny on the Sunshine Coast, when you visit our slice of paradise you really feel like you’ve escaped. Maleny has an influx of tourists wanting a weekend getaway, there are a good choice of local restaurants, with some offering courtesy transport or alternatively delivered straight to your room. Our luxury accommodation can even accommodate a relaxing in-house massage, so you don’t even need to leave your own little oasis. When you visit our little slice of heaven, you can enjoy the peace and serenity of the beautiful countryside, or if you decide you want to explore, you won’t have to venture far from our luxury accommodation to find something of interest. Is the family in town for a wedding? Maybe it’s your wedding? Why not make the most of everyone being together? 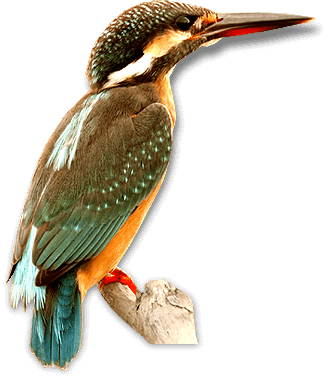 Our luxury accommodation offers 6 luxury cabins and a garden room, with disabled facilities. You can also make use of the main home, lounge, deck, BBQ and Pizza Oven, we can even organise a meal in the main home by request. 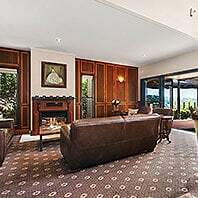 Top of the Hill also provides an intimate venue for a special occasion, whether it’s a birthday party, group getaway or anniversary celebration, close family and friends can stay on the beautiful grounds and make the most of an extended weekend getaway in our beautiful accommodation on the Sunshine Coast. Are you looking for a unique venue for your next corporate planning day & want to get out of the office? Looking to reward your work colleges and create a team building event? Top of the Hill provides a venue that is adaptable for small corporate events. The function centre can accommodate meetings, break out areas and has an outdoor covered deck area with solitude views. Inspiration can be discovered in this uninterrupted venue. When you really want to get away, Top of the Hill provides an idyllic escape. With rugged countryside and views of the clouds rolling in over the valley, you won’t want to leave. For the perfect romantic getaway on the Sunshine Coast, Top of the Hill’s luxury accommodation provides the perfect location. Nestled into the hillside of the 2.3 hectare property, six private cabins provide an unforgettable experience of luxuriously appointed accommodation overlooking lush valleys dotted with cattle, and shared with a large variety of birdlife. This room is a basic style Motel Room with disability access. Great if you are looking for a clean, quite and recently refurbished room for a short stay, local wedding or corporate accommodation. This room is located on the ground floor of the main building with garden views. Queen-size bed dressed with crisp white sheets and cosy doona. Flat-screen TVTea and coffee making facilities. Mini bar with fridge and wine glasses. The Garden Room is linked to the main building with a covered walkway. Parking is close to the Garden Room for easy loading and unloading. About Maleny on the Sunshine Coast Hinterland, Queensland. Mary Cairncross Park – just minutes up the road, with its beautiful walks through majestic rain forest where you can make friends with the pademelons and try to identify the many birds that live here, including the magnificent regent bower bird. Gardner’s Falls – on Gardner’s Lane just off the main road to Maleny. Take your lunch and enjoy a picnic on the grassy banks of the Obi Obi Creek, or swim with the locals in the cool swimming hole below the waterfall. "Had a beautiful stay - very relaxing and peaceful. Will be back next year." © Top of the Hill - Romantic Cabins Maleny. Top the Hill offers luxury cabin accommodation for couples at reasonable rates in the Sunshine Coast hinterland.